She is a middle-aged woman, and her fame has spread far and wide in Struma Valley, Bulgaria. If business is bad, or you are unlucky in love, sick at heart or fed up to the back teeth with life in general, you ask her advice. She charges you ten Levs. She speaks softly as I am not there. “I was blazing like a torch, head over heels in love with a young guy, a petty trader that sold brandy in the town of Pernik. One day he came to my orchard and studied my plum trees, but I doubted he saw anything in particular. He wasn’t paying attention to the fruit - you can take my word for it - he gave me the eye instead. “You’re very pretty,” he said. “What do you want?” I asked mincing no words. I knew what he was after. I possessed a whole slope, every square yard of it, planted with plum trees. You see, I was a wily thing and I still am. It’s true I have freckles across my cheeks, but this doesn’t mean I am unable to do my job standing on my head. I bought a long hill, then another one, so I held all plum trees in the district in my hands. The plums are a woman’s best friend; you should not forget that, my dear girl. Plums are brandy in the future tense. “You are very intelligent,” the petty trader said. “How much do you want?” he asked. “Okay.” In a flash, he downed the brandy I gave him, and his eyes gleamed eager to slit my throat. …“I’ll be honest with you, my girl,” the woman turns to me, her eyes fastening on my face. “Love happens after the second glass. No second glass, and the guy constantly finds fault with you. It’ll be your nose that might seem too long; your legs will be far from perfect, but after the second one bout your nose and legs are a treasure. Well, the trader’s love was nothing much to speak of. Quite a few blokes have drunk two glasses of my brandy, and a lady learns to judge a guy by the way he finishes his drink. “The first glass of brandy shows you the fire pit over which he will roast you once he has you eating out of his hand. Men are wicked, my dear. The second glass tells you if he’s got a heart of gold or a bottle of poison in his chest. The petty trader’s heart was neither fish nor fowl. I was at a loss. “O, come off it,” I told him. I took all his cash, that was all there was to it. I carefully searched his pockets, extracting every bill or coin I could lay my hands on. Any guy deserves that; fleece him, take his money and send him to another woman. Let her wash his socks and listen to the loads of baloney he’ll be babbling day and night. “Yes, he’s kind-hearted as long as he doesn’t meet a mademoiselle blonder than you, my dear. She’ll grab his money, then they’ll drink two glasses of brandy together, and you will iron his shirts. A day later, he’ll say he’s unhappy, and you’ll be supposed to wipe off his tears for him. Now listen to the end of my story, and you’ll learn a thing or two. “I won’t go home,” the petty trader repeated. I tell you, my dear girl, the brandy we make in the town of Pernik is magnificent. After the second glass, the guy falls in love with you, and after his third he’d die for you. But love happens only to living men, doesn’t it? So, I collected the guy’s pants, shirt and jacket, rolled them into a ball, and tossed everything in the street. “I’m not a hotel manager, and my house can’t accommodate you. Good bye,” that was what I told the petty trader. On the fallowing day the guy came to my shop again. “I’ve already sold the plums to another man,” I informed him. The petty trader burst into tears, his cheeks shone wet, his closed eyelids fluttered, and he was a sorry sight. I’d been selling plums for five years, and many a time had I drunk two glasses of brandy with the most attractive buyers, but none of them had ever sobbed like this. “You are a peach!” the buyers said, but I didn’t swallow the bait. Remember, it’s the brandy that’s a peach, not you. You may apply a truckload of make-up on your face or spread a layer of fond de teint a foot deep over your pores. All will be all for naught. It’s your plums they are after. “Do you run your own business?” I tried hard to extract additional information from the guy. “Do you have money?” I said, digging deeper into the matter. He spoke up, choking on his own tongue. “You are not worth a dime,” I accused him. “What will I do with you?” I wondered. “Drink two glasses with me,” he suggested. Was it his tears or his daft answers that made his eyes shine like the sun and the moon? “You are very pretty,” he said. We drank brandy, a glass then a second one, and from then on, my dear girl, I know for sure: all men are stones. It’s you who decides if you’ll lug your man tied to your neck all your life, or throw him in the mud and step on his head to keep your evening shoes clean. There is yet another option: you’ll drink two glasses of brandy with the guy, and like I did, you’ll give birth to his children, all three of them pre-e-e-tty like the sun. And there’s something else. Every time I look at the mirror, I say to myself: he’s judged correctly, yes, I’m pretty. Therefore, my dear, all men are stones, but only one among them is a precious stone. He is your man. The way he dresses makes you suspect he has bad taste in clothes. He is wild and, honestly, you don’t think he has the skills to operate a business, but he is your gemstone. Take care of him. Now, run to the nearest supermarket and buy a bottle of brandy. Two glasses are enough, not a drop more, not one! 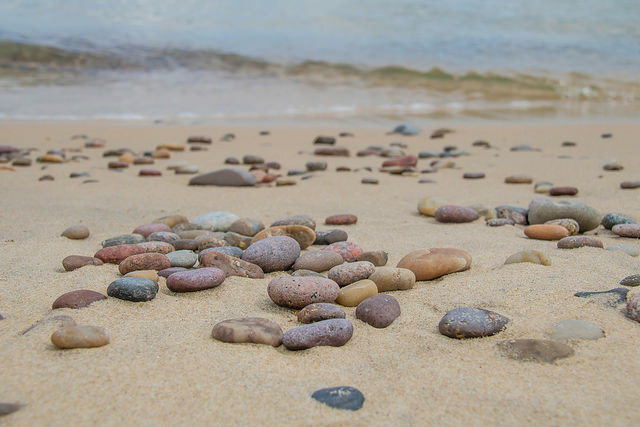 Image: "Pebbles on the Beach" by Susanne Nilsson.